Given that frozen shoulder affects 2-3% of the population at some time in their lives and a huge 20% of people with diabetes(2), so today we explain what it is and what can be done to help if this happens to you. 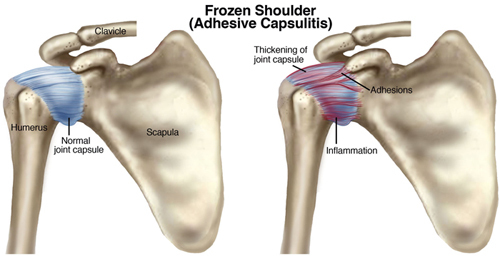 Adhesive Capsulitis or better known as Frozen Shoulder, is a common condition often brought on by prolonged periods of excessive immobilization of the shoulder joint, for example, following a shoulder fracture where the shoulder is in a sling or after surgery where 6 weeks of immobilization is often needed. It can also follow an injury to the neural structures in the neck but it can often happen spontaneously. Frozen shoulder can literally do just that – freeze the whole shoulder joint and cause restriction and loss of function. Accompanying the loss of movement within the joint is usually swelling and pain. On average, adhesive capsulitis will resolve on its own over about 1.5-2 years. Soft tissue therapy such as massage can provide huge amounts of relief. Gentle stretching and passive movement of the joint by a therapist can help ease the tension and get the joint warmed up and moving again at certain stages and deep tissue massage and fascial release of the shoulder joint’s surrounding muscles can also assist with rehabilitation. However, this will depend on the stage of the injury process, as at certain points these therapies will help with relief but will not make any improvements in movement. As always, prevention is the best cure by managing risk factors well and seeking treatment for any shoulder injury and physiotherapy ASAP after any surgery.